Lace Front Wig Cap Designs? "What are the different lace front wig cap designs? 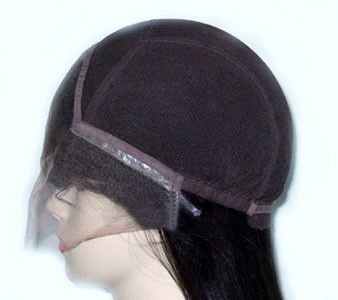 Find the right lace front wig cap construction can seem daunting, but it needn't be. We've put together a guide covering all of the main lace front cap constructions and in this article we'll provide an overview of some of the more frequently found designs. 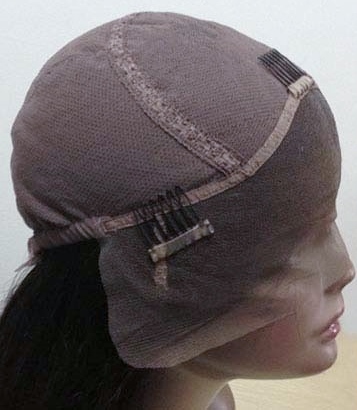 All of the following cap constructions are available in French lace more durable (due to slightly smaller holes) and Swiss lace more fragile (due to larger holes). Lace front wigs traditionally came with adjustable straps at the back or an elasticated perimeter at the back and possibly a clip at the back as they were normally worn with the use of adhesives. This is a really easy lace front cap construction to use and is a great option for those who are new to wearing lace wigs (lace front or full lace wigs) as well as being popular with those who have worn them for some time. Equally, the adjustable straps can reduce the overall circumference by up to four centimetres (approximately 1.5 inches). This means that if your measurements are slightly smaller than the standard 22.5 inch lace front cap, then you'll be able to adjust it to make it smaller. There are variations on this including choosing thin skin at the front or silk top (4"x4" silk base) at the crown. Check out the detailed guide about this cap construction that shows more variations and whether this option is suitable for you. The open wefts through the middle and reaching the back of the cap means there is no integral solid cap - this wig is sometimes referred to as "capless". 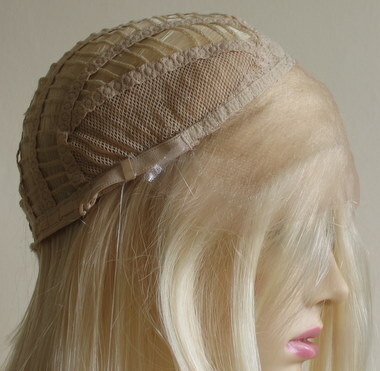 There is a common variation where there is a stretch lace mesh at the material at each side whilst the majority of the open wefts are from the crown to the back (see image of blonde lace wig). Usually the lace colour for standard stock lace wigs is medium brown, but typically if the hair on the lace wig is blonde the lace is light in colour as in the image to the right. The colour of lace you choose for your lace cap wig or full lace wig will be the colour that is seen when your hair is parted. However you can wear a cap underneath that matches your skin tone if you’d prefer. The general rule to follow if you're unsure of which lace colour to choose, is to go for a colour that's the same or lighter than your skin complexion (as the scalp is typically lighter in colour than the skin tone on the face) and you can find out more about that here. The term glueless refers to whether a lace wig requires adhesive (glue or tape) in order to be worn as historically lace wigs were secured to the head by the use of adhesives. 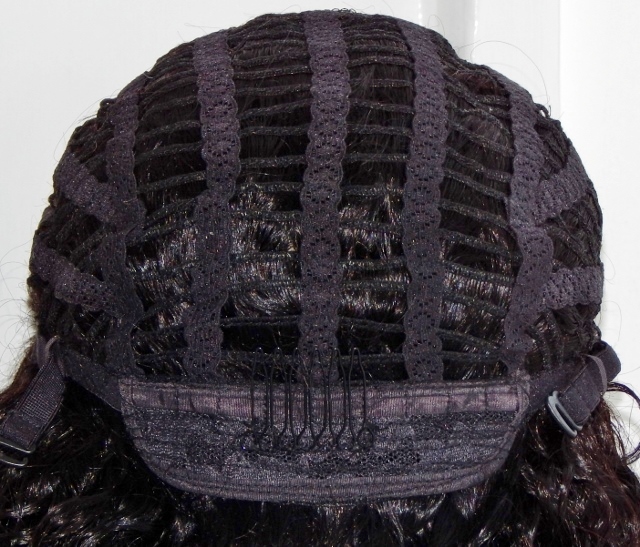 The glueless lace cap wig has lace at the front (between one and five inches), the rest of the cap contains variations of the following: open wefts, closed wefts or stretch lace (hand tied hair, no wefts); adjustable straps at the back or whole perimeter; clips or combs (or both) that can be located at the back, crown, sides (sometimes on tabs located near the ears); and you can find out more details in glueless lace cap wig guide. That's the forward march on lace front wig cap constructions but if you're considering full lace wigs, then there's a similar overview on the frequently found full lace wig cap constructions. If you’d like more information you can peruse the Lace Wig Q&A section or if you'd like to be first to read new guides and articles, why not join our blog - it's super easy to do and doesn't require any personal info!